William Henry Jackson, photographer Detroit Publishing Co.
Detroit Publishing Co. No. 014271. The CHALMETTE was built in 1881 at Jeffersonville, Indiana as the City of Vicksburg for the Anchor Line Packet Company of St. Louis, Missouri. 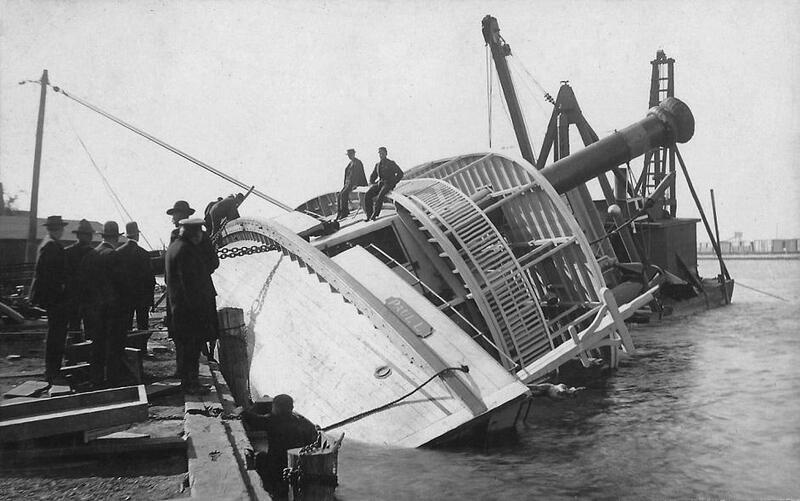 She was wrecked by the cyclone in St. Louis on May 27, 1896 along with four other Anchor Line steamers. 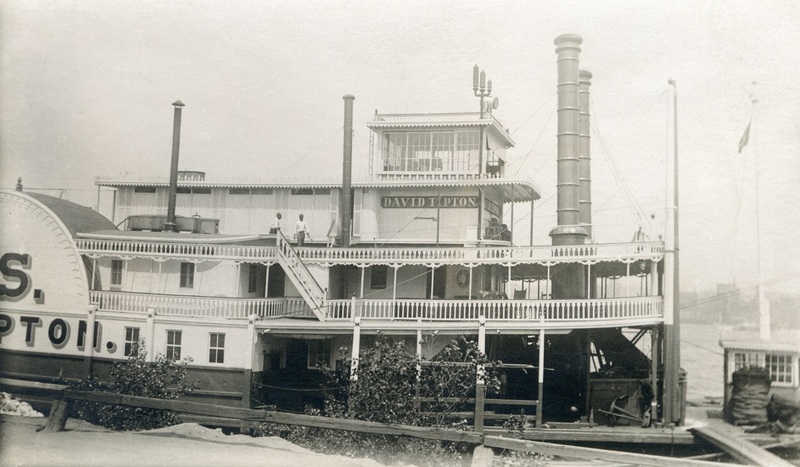 In the process of rebuilding by Captain W. H. Thorwegan as an excursion boat she was purchased by the Illinois Central Railroad interests and renamed CHALMETTE, after a New Orleans suburb. She continued to operate as a packet boat on the lower Mississippi but sank in 1904 at the head of Deadman's Bend, about 60 miles below Natchez. Cropped high angle photo taken in 1910 of Captain Cooley's AMERICA at Angola Landing, adjacent to Louisiana State Prison Farm on the Mississippi River. 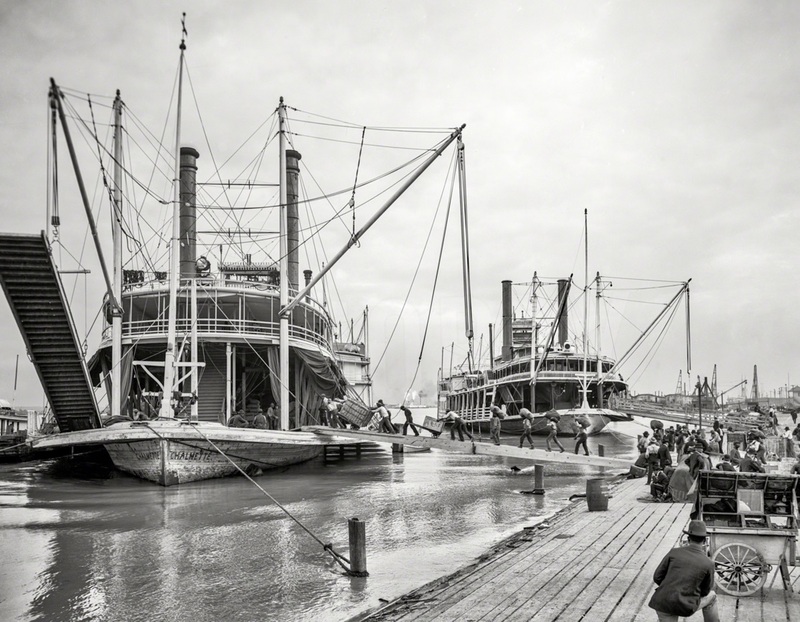 The AMERICA was one of the most photogenic and iconic of all the sternwheelers and was Cooley's favorite boat as well. With few exceptions all photos of the boat are inspirational when it comes to an "ideal" Western Rivers steamboat realizing its full potential. Since 1906 tourists by the thousands have enjoyed the scenic beauty of the world famous Dalles of the St. Croix River by excursion boat. 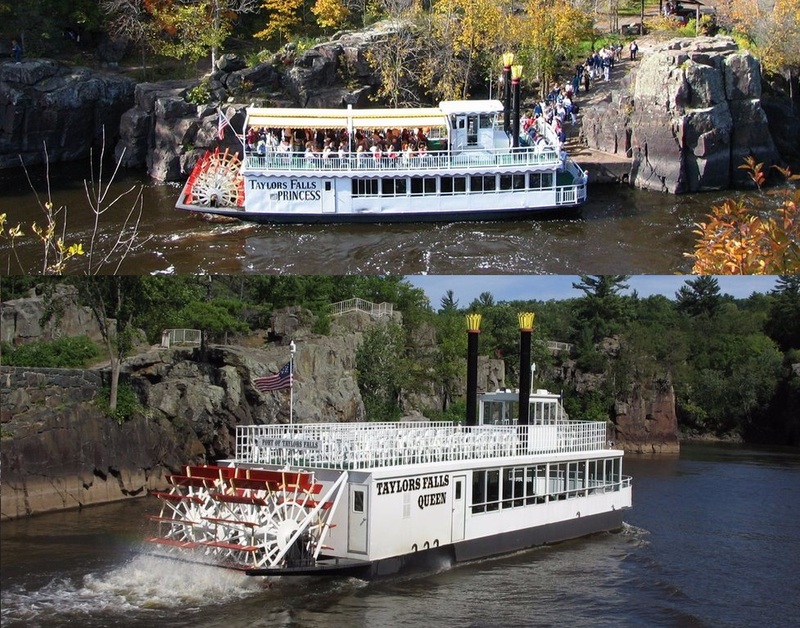 Our fleet of excursion boats includes the Taylors Falls Queen and the Taylors Falls Princess. Since 1906 tourists by the thousands have enjoyed the scenic beauty of the world famous Dalles of the St. Croix River by excursion boat. Our fleet of excursion boats includes the Taylors Falls Queen and the Taylors Falls Princess. The "Princess" can carry up to 250 passengers with The "Queen" holding up to 149. Both boats are enclosed on the lower level & the upper decks are open. Daily Excursions are either 45 or 80 minutes. Your licensed boat pilot and tour guide will point out the unique rock formations that were left behind as the glaciers retreated thousands of years ago. Among the most outstanding formations is the huge stone cross for which the St. Croix River was named. "St. Croix" means Holy Cross. Other sites that can be seen from the boats include the world's largest glacial kettles or "potholes", Lion's Head, Turk's Head and the highlight of the boat tour, The Old Man of the Dalles - the most outstanding natural rock face you'll ever see. An afternoon on the St. CroixPublished on Sep 16, 2015YoutubeAn excursion on the St. Croix River aboard the Taylors Falls Princess - an 80 foot long authentic sternwheeler. Here, near my home, the St. Croix River is its most scenic, running through towering basaltic cliffs and ledges (known as 'the dalles") and bordered by white pines - a ghost of the plentiful logging stands of centuries past. 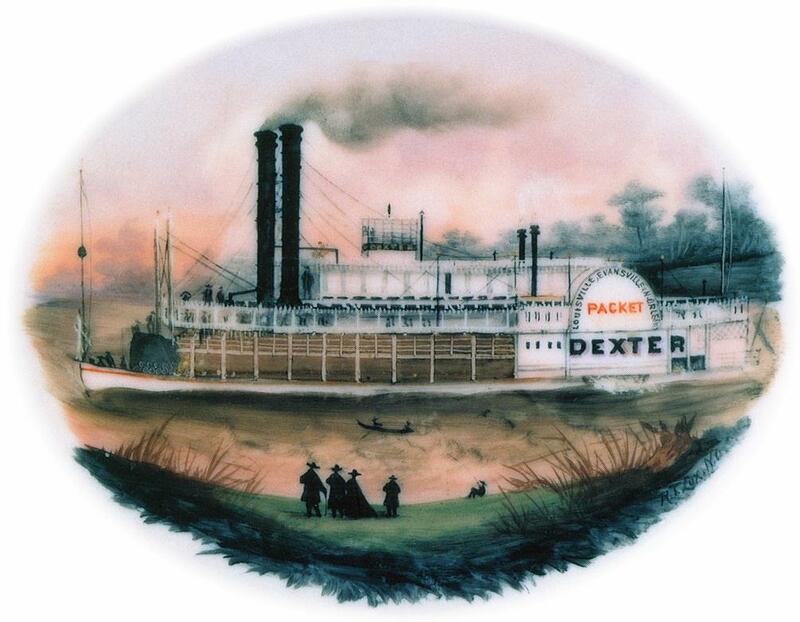 Steamboat DEXTER 1868 - 1874 painted on a China plate by New Orleans artist Rudolph Theodor Lux. This is a detail from the color photograph of the plate on the cover of the Minneapolis Institute of Arts catalogue for the exhibition CURRENTS OF CHANGE - "Art and Life Along the Mississippi River 1850-1861." 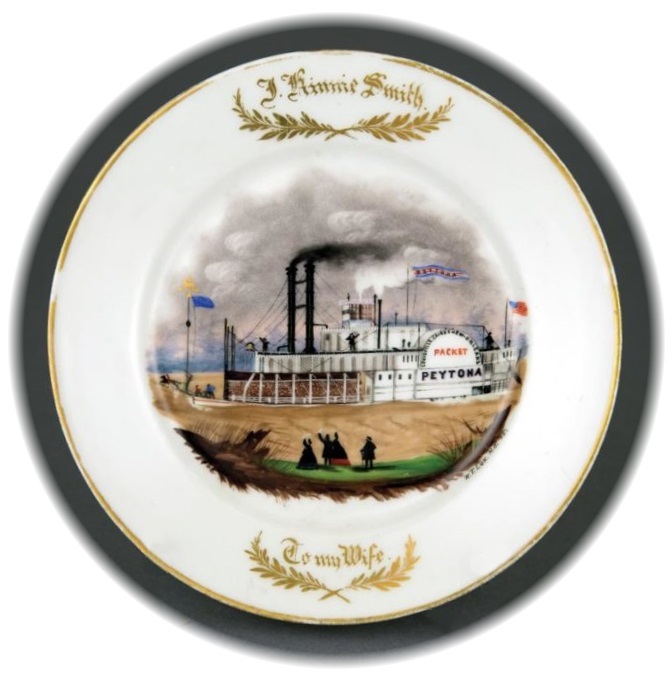 Lux's 1865 painted plate of the steamboat PEYTONA 1859-1861 is from the Historic New Orleans Collection. Rudolph Lux was active in New Orleans from 1856 to 1858 and was considered to have been the premier porcelain painter and gilder working in New Orleans in the mid 19th century. He was born in Germany, and specialized in portraying prominent persons including Civil War figures on porcelain plates and cups. Renamed the W.W. in 1905 in honor of Captain Walter Wisherd. The W.W. and the J.S. were popular excursion boats on the upper Mississippi River. Captain Rounds bought the W.W. in 1917 to replace the Golden Girl. She ran excursions and in the summer of 1918 was in Nashville, Tennessee. 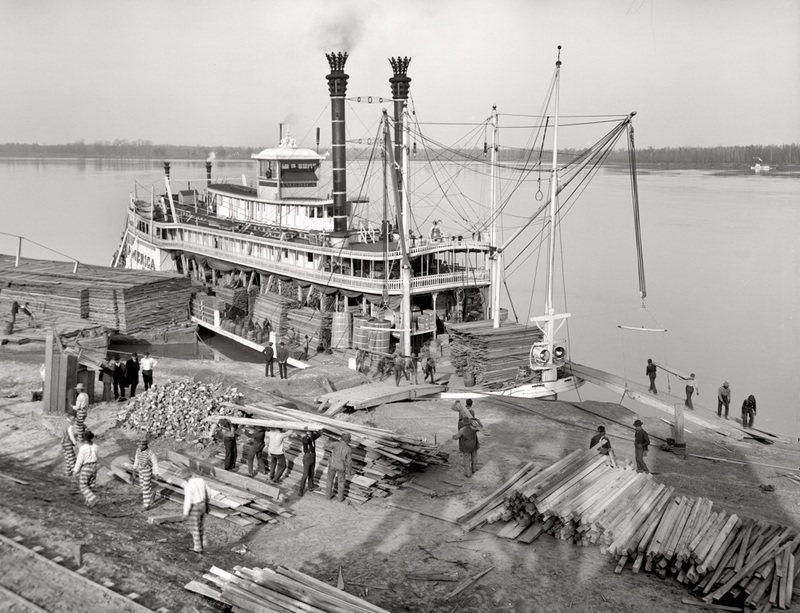 In 1920 owner John Klein used her to tow barges loaded with pipe from the upper Ohio to the lower Mississippi. In 1921 she was bought by Captain Gaches who used her to tow his showboat. The show was boycotted at one point by people of of Crown Hill, West Virginia who assumed that the name of the boat, "W.W.", stood for Woodrow Wilson. Captain Gaches replied that the initials stood for "Western Waters" and so the show went on. 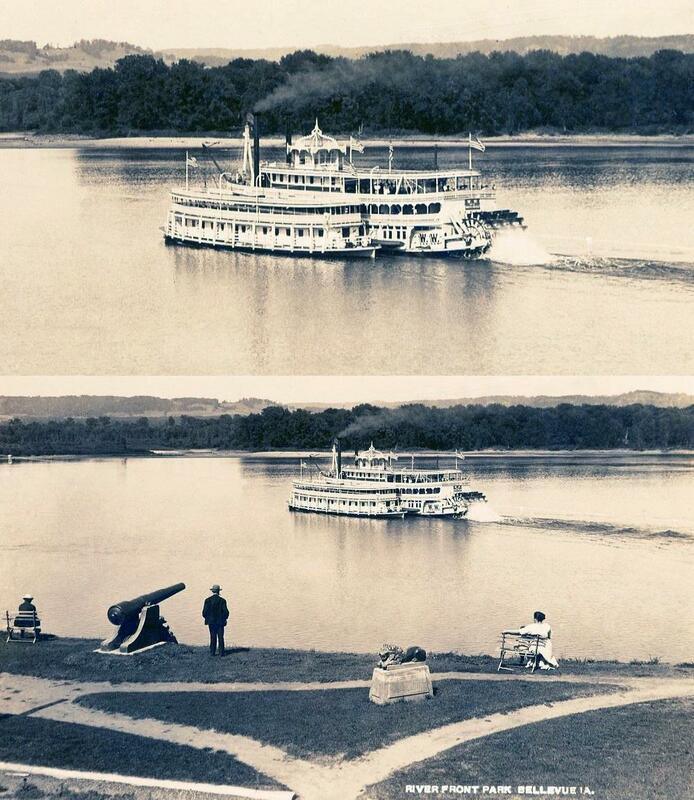 The W.W. was lost in a windstorm at the head of Brush Creek Island on the Ohio River in the spring of 1922. 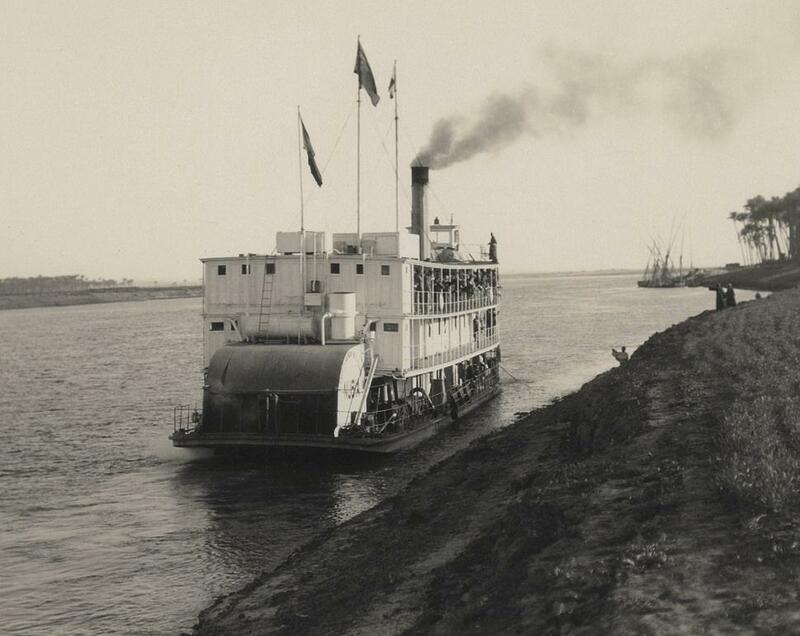 1st: "Cotton on the levee, New Orleans"
2nd: "On the levee, New Orleans"
Undated photo of a sternwheeler on the River Nile near Bedrashen, Egypt. Undated. The name on the side of the housing covering the paddlewheel appears to be NUBIA. ABOUT THE P.S. (PADDLE STEAMER) "PYAP"
Cruise the mighty Murray River aboard the PS Pyap. One hour cruises depart from the Pioneer Settlement wharf each day, taking you upriver past the Riverside Caravan Park, Murray Downs Marina and the historic Murray Downs Homestead. The paddlesteamer Pyap was built at Mannum in South Australia in 1896. Despite her great size - she is almost 30 meters long and 4.8 meters wide - she has a very shallow draft which means she can float in less than a meter of water. In her early days she was used a floating general store. She travelled the lower Murray River, stopping at small towns and farm stations along the way. Inside, she had a serving counter, a store section and a separate drapery at the rear of her lower deck. The crew slept on the upper deck. The PS Pyap travelled 500 kilometers each week selling goods to settlers at over 60 settlements and landing places along the river. Cruise the mighty Murray River aboard the PS Pyap. One hour cruises depart from the Pioneer Settlement wharf each day, taking you upriver past the Riverside Caravan Park, Murray Downs Marina and the historic Murray Downs Homestead. Cruises are daily at 2.30pm. On weekends, public holidays and Victorian school holidays, an extra cruise also departs at 10.30am. Boarding of the Pyap is via a ramp and at times depending on river levels can become quite steep which some visitors may find it difficult to manage. Please note cruises are unavailable each February as the Pyap undergoes maintenance. Set on three hectares of land on the banks of the Little Murray River, the Pioneer Settlement lets you experience Australian history first hand. You will find real-life Mallee cottages, a hotel, schools and shops, plus our enormous collection of working tractors and machinery - sourced mostly from the local area. You can feel the heat in the blacksmith shop, listen to the sounds of the old Pianola or take a ride through our Mallee township on a horse and cart. As you wander the site, you can also chat to our staff and volunteers, all looking the part in costumes of the period. The Pioneer Settlement opened in 1966 after a joint community and government effort to recognize the unique history of our Murray Mallee region. By the 1970s, the Pioneer Settlement was one of the most popular tourism destinations in Victoria, if not Australia, and the concept has been emulated around the country. The Settlement is now introducing more ground-breaking tourism concepts to complement the historical Mallee townships. The Heartbeat of the Murray Experience will include a laser light show that, in a world-first, will combine modern laser technology with the natural river environment. It will tell the story of the Murray region from prehistoric times until today. Just arrived today from the UK . . . in a 1910 issue of and Engineering journal. The "River Queen" with twin sternwheels was very likely based upon these drawings of the ETOBE for the 1940 movie SAFARI which was filmed on Baldwin Lake in the Los Angeles County Arboretum. McKie and Baxter of Copland Works, Glasgow. 1891 it acquired limited liability, as Ardrossan Dockyard Ltd, but was dissolved eight years later, at which time a successor company, the Ardrossan Dry Dock & Shipbuilding Co Ltd was incorporated. 1899 the name was changed to the Ardrossan Dry Dock and Shipbuilding Co. The yard was also expanded up to five berths in 1916 and the number of employees was 2,300. The WORLD OF MOTION at Walt Disney World EPCOT sponsored by General Motors, was the former tenant of the Transportation pavilion at EPCOT (Experimental Prototype Community of Tomorrow) in Orlando, Florida. It was an opening day attraction at EPCOT Center in 1982 and closed in 1996. 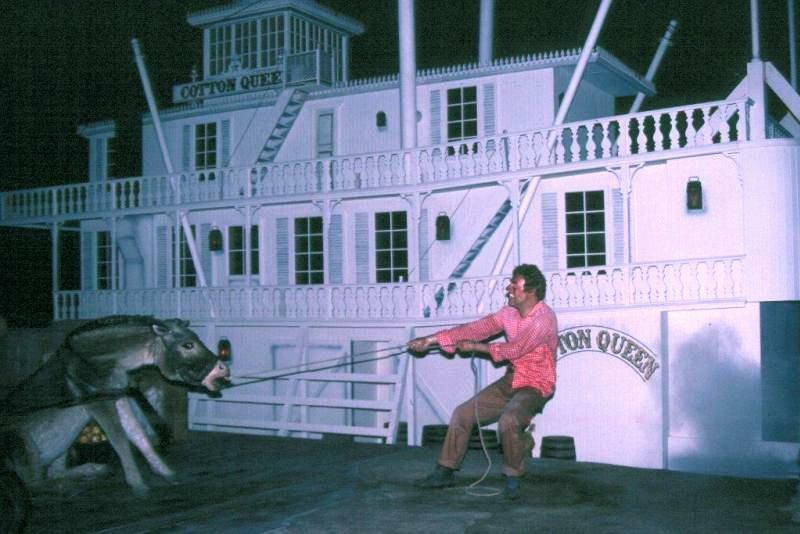 The steamboat COTTON QUEEN mock-up seen during the ride-through was supposed to demonstrate "the evolution of steam" and featured an audio animatronic roustabout pulling the rope connected to a stubborn mechanical donkey on a wharf at a landing somewhere along the Lower Mississippi. "Although it's now just a part of EPCOT's history, World of Motion was one of the park's original attractions that guests flocked to on opening day. The attraction, then sponsored by General Motors, took guests on a time travel journey through the history of transportation - man's foibles and triumphs in designing new vehicles, the age of flight, and the development of the horseless carriage, as well as the transportation trends our culture latched on to like the bicycle, the family Sunday drive, and the summer road trip." P.S. from Dave: "I don't recall seeing the WORLD OF MOTION during my visit to EPCOT in November 1989 when I was sent down for a week as a consultant to the Florida branch of Walt Disney Studio's Animation studio." This 6 1/2 x 9 1/2 print of an unknown lady standing in front of the texas cabin with the pilot house above and the portside stack on the right was rubber stamped 27 November, 1936. The boat's name was readable on the side of the bucket in front of the screen door to the texas cabin. 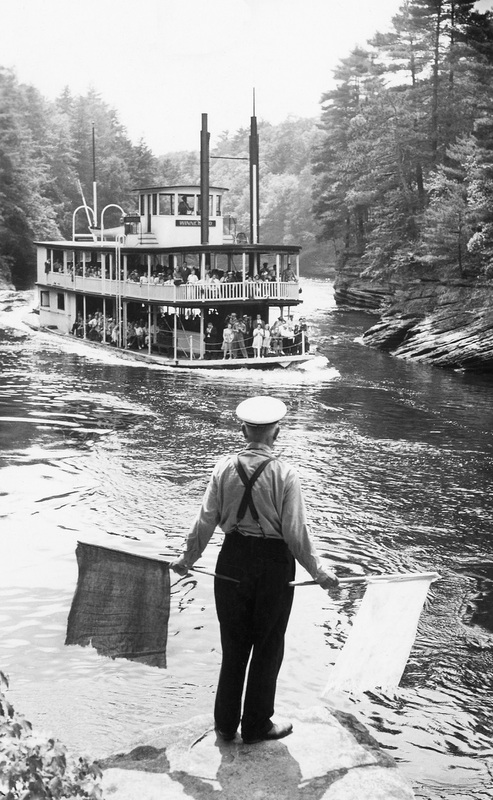 Nice image taken 22 August 1959 of a senior crew member in the foreground holding semaphore flags in order to signal to the pilot of the excursion steamboat WINNEBAGO, full of passengers as it gave a tour of the Wisconsin Dells in central Wisconsin. Flag semaphore (from the Greek σῆμα, sema, meaning sign and φέρω, phero, meaning to bear; altogether the sign-bearer) is the telegraphy system conveying information at a distance by means of visual signals with hand-held flags, rods, disks, paddles, or occasionally bare or gloved hands. Information is encoded by the position of the flags; it is read when the flag is in a fixed position. Semaphores were adopted and widely used (with hand-held flags replacing the mechanical arms of shutter semaphores) in the maritime world in the 19th century. It is still used during underway replenishment at sea and is acceptable for emergency communication in daylight or using lighted wands instead of flags, at night. Best of many photos taken of the 1910 capsizing of the PAUL L. at Oshkosh, Wisconsin. I had sent some in the past but don't think any of them are posted anymore. This should join the new category "Mishaps and Disasters" of which we have many photos and also engravings, so please use items from those categories to create the new page. "Paul-L Capsized Oshkosh Wisconsin" Photograph of the steamboat "Paul L" capsized at Riverside Park, on the Fox River at Oshkosh, Wisconsin. On May 28, 1910, the Paul L was being unloaded of a cargo of coal, too much was removed on the starboard side and the boat rolled over. No one was hurt, but the cook and the ship's mate were thrown into the river. The boat was righted by pumping out the water while barges with cranes lifted from the river and tractors from the shore pulled the boat upright. The "Paul L" was named for Captain Paul Le Fevre's oldest son. 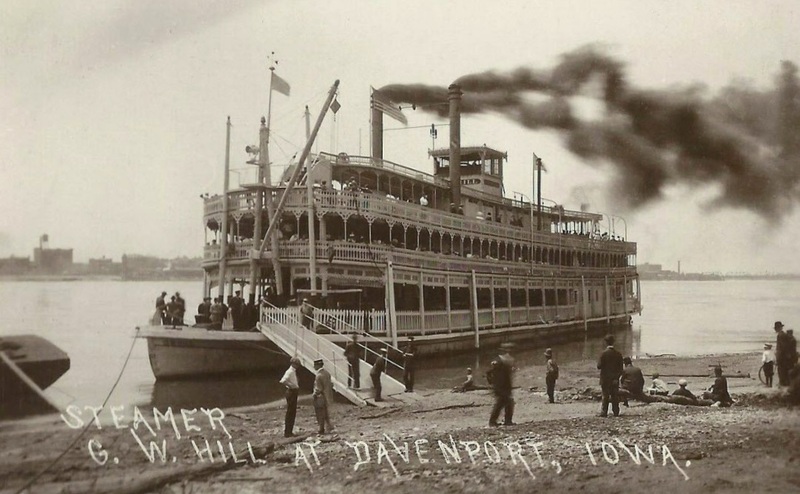 The steamer was built in 1907 by the firm Ryan Brothers (George & James) in Oshkosh and had a length of 124' and a beam of 21' it served the Oshkosh to Tustin run on Lake Poygan. It was operated by the Clark & LeFevre Company. The Paul L was sold in 1921 to Harry D. Meyer, R. C. Brown Jr. & J. C. Thompson of Oshkosh, later it was turned into a barge and operated at Appleton, Wisconsin, it sunk in 1923 and was never sailed again. The caption above was derived from Oshkosh Past Perfect online that referred to a different image of the same event. 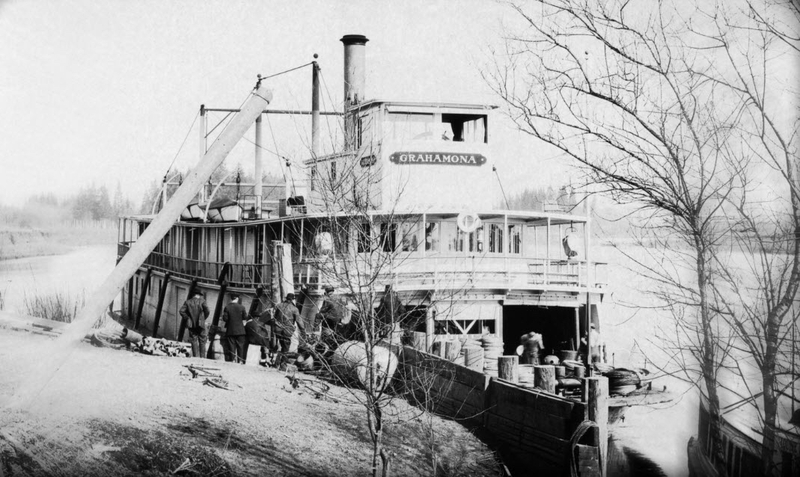 Photo circa 1912 taken of the GRAHAMONA on the Albany, Oregon landing at the confluence of the Calapooia River and the Willamette River, just east of Corvallis and south of Salem. Built by Joseph Supple at Portland, Oregon in 1912 for a total cost of $35,000 for the Oregon City Transportation Co., to serve in their Yellow Stack Line. 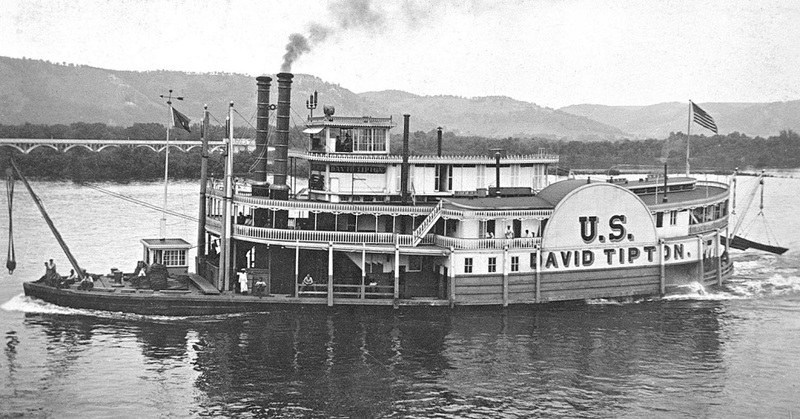 The boat was especially designed to serve on the shallow waters of the upper Willamette River; one of the largest steamboats ever to operate there and later would navigate on both the Columbia and Snake Rivers for the Inland Empire Truck & Boat Co. and the Portland Navigation Co. In 1920 the GRAHAMONA was sold and her name changed to the NORTHWESTERN. In 1939, the vessel was sold again, and transferred to Alaska for service on the Kuskokwim River. By 1949 she was out of service and was abandoned on the riverbank at McGrath, Alaska. Built in 1909 at Jeffersonville, Indiana by Howard Ship Yards, for the St. Louis-Calhoun County apple trade. Original price $28,850. Named for Granderson Winfrey Hill of Alexandria, Missouri. Owned by Captain D.W. Wisherd and Sam Gregory whose home port or residence circa 1909 was St. Louis, Missouri. Converted into an excursion boat in May 1912. 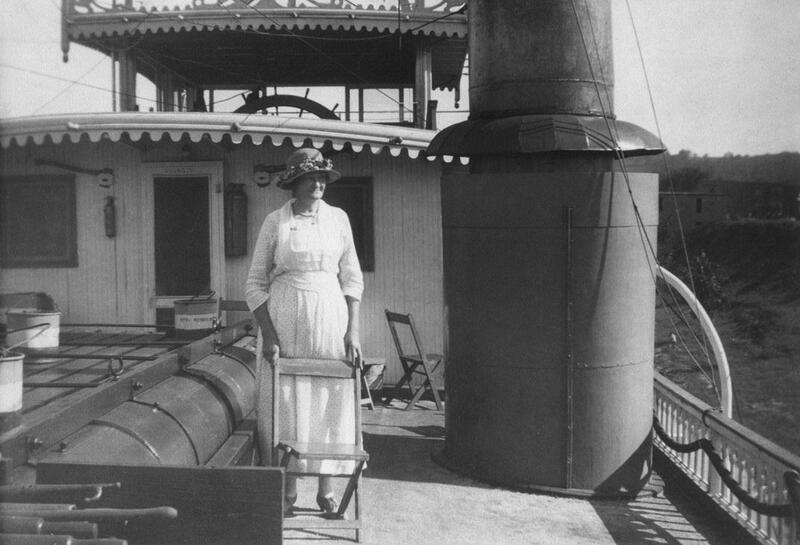 After World War I she commenced tramping to the upper Ohio River, she also went to New Orleans, Pittsburgh, etc. until sold in 1923 after the steamboat fire at Cincinnati, Ohio (November 4, 1922). Became the ISLAND MAID in 1923. 11 X 13 INCH BLACK & WHITE PRINT ON POSTER BOARD. TAKEN IN THE LATE 1950'S OR EARLY 1960'S. 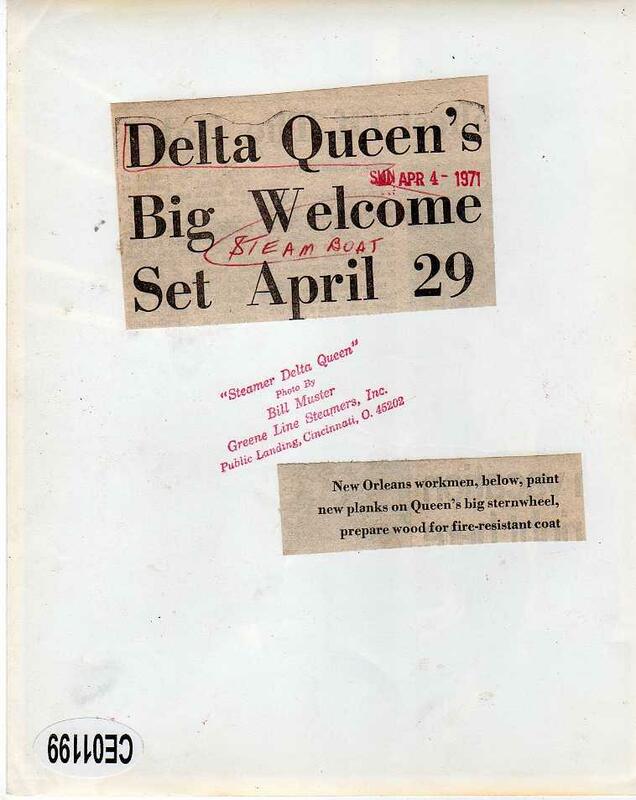 THE DELTA QUEEN WAS MOORED AT MARIETTA, OHIO FOR A SHORT VISIT. THE BRIDGE IN THE BACKGROUND IS THE OLD MARIETTA, OHIO TO WILLIAMSTOWN, WEST VIRGINIA BRIDGE. 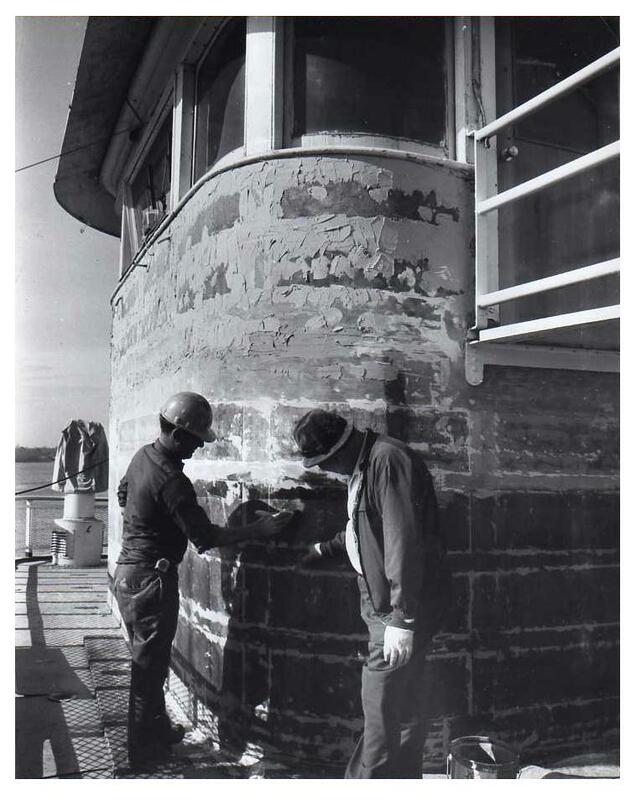 Fireproofing the Delta Queen Steamboat 1971 - photo by Bill Muster. The Department of the Interior designated the U.S. Snagboat Montgomery a National Historic Landmark in June of 1989. Serving as one of the last steam-powered sternwheelers to ply the inland waterways of the South, the Montgomery's impressive history involved seven of the South's navigable rivers. 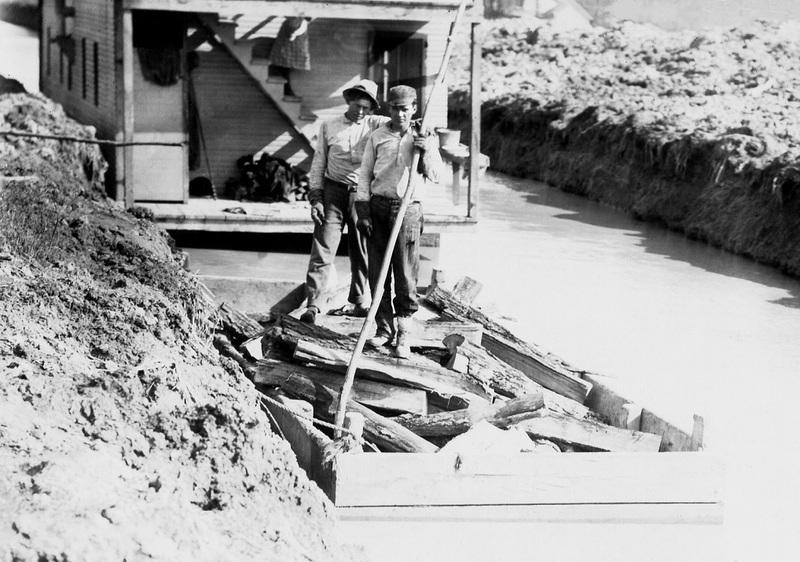 Beginning on the Coosa and the Alabama rivers from 1926 to 1933, crews used her derrick and grapple to remove snags and debris from the river channels. In 1933, she was transferred to the Black Warrior and Tombigbee rivers. Her final work stations were the Apalachicola, Chattahoochee, and Flint rivers in Florida, Alabama, and Georgia, where she served until her retirement in 1982. The Montgomery was one of the hardest-working snagboats in the Southeast. She was commissioned by the Montgomery District COE and built in 1926 by the Charleston Dry Dock and Machine Company of Charleston, South Carolina. The boat was based in Montgomery until 1933, when the Montgomery District became part of the Mobile District, and the boat was moved to her new home port of Tuscaloosa. However, she continued to work the waters of the Coosa River system, adding the Black Warrior-Tombigbee Rivers to her responsibilities. The Montgomery pulled snags from these river systems until 1959, when she was transferred to Panama City, Florida. She worked on the Apalachicola, Chattahoochee, and Flint rivers from 1959 for the rest of her career, though her home port was transferred from Panama City to White City, Florida in 1979. 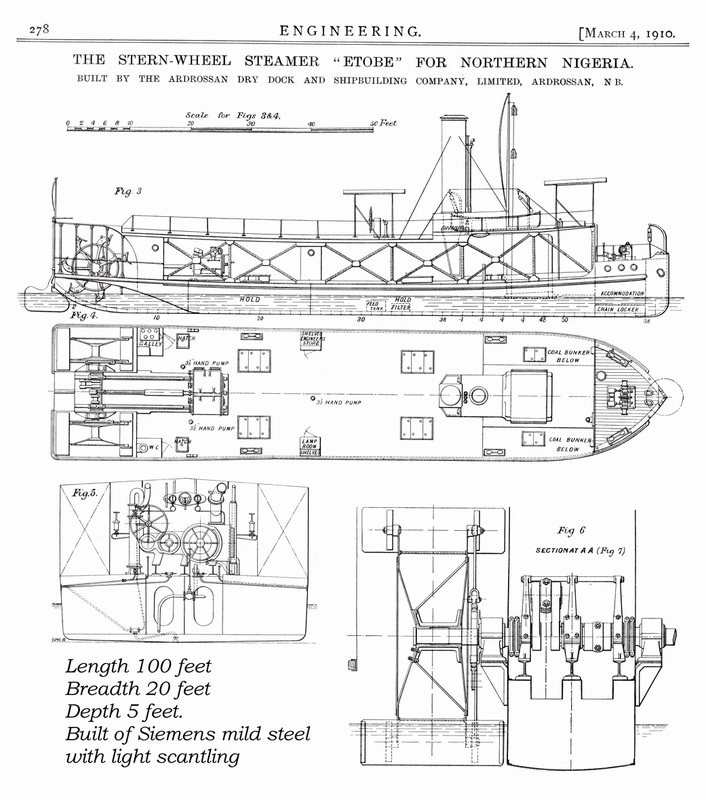 The Montgomery is a riveted steel sternwheel-propelled vessel with a steel hull and wood superstructure. The overall length, including the sternwheel, is approximately 54 meters (178 feet), while the maximum width is approximately 10 meters (34 feet). The depth of the hold is 1.8 meters (6 feet). The Montgomery has three decks. The propelling and snagging machinery, crew quarters, and the engine room are located on the main deck. The second deck contains the galley, officers' quarters, and an office; and the pilothouse at the top of the boat contains controls for the snagging boom and engine room. The boom is operated by two large steam winches; one turns the boom in an arc in front of the boat while the other lifts the snag. The Montgomery still has its original Scotch boiler, which created steam to power the boat. Water was heated inside a cylinder within the boiler. The steam produced by the boiler was extracted from the top of the boiler and passed through the main steam line overhead to the engine room in the stern. The boiler originally burned coal, but was converted to burn fuel after World War II. The engines are high-pressure, or non-condensing, joy valve engines; and the paddlewheel is constructed of steel and wood and is 5.5 meters (18 feet) in diameter and 6 meters (20 feet) long. One interesting feature of the Montgomery is the telegraph machine located in the engine room. The machine has a dial with a hand that points to different possible engine room actions and is the way the pilot originally communicated with the engineers; a similar telegraph is located in the pilot house. In early November 1964, the Montgomery assisted in raising the remaining section of the Confederate Gunboat Chattahoochee from the channel of the Chattahoochee River. The activities are recorded in the Master Fleming's daily log: "Picking up stern section of Gunboat and Removing it from channel. While picking up Gunboat and trying to work it on the bank some of the upper sections of the boom were sprung." Today the Confederate Gunboat Chattahoochee can be seen at the Port Columbus National Civil War Naval Museum in Columbus, Georgia. 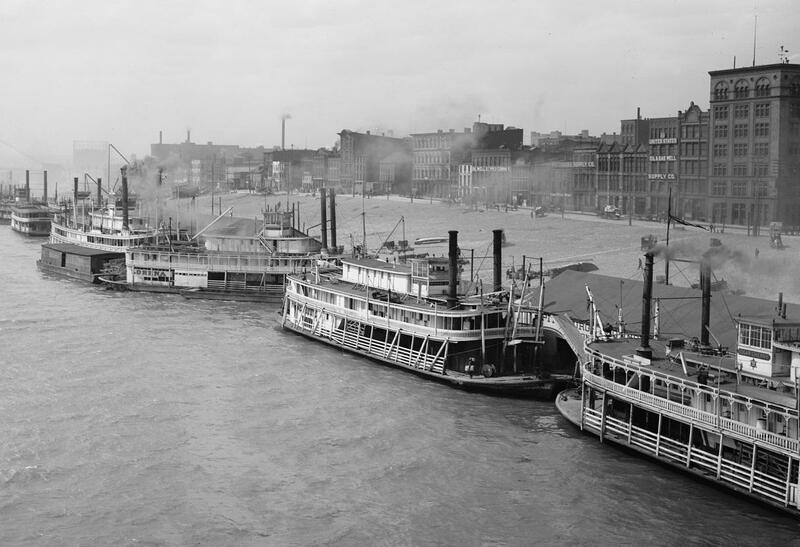 Steam-powered boats, like the Montgomery, dominated transportation and commerce for most of the nineteenth and early twentieth centuries; however, river transportation began experiencing competition from railroads as early as the mid-nineteenth century. 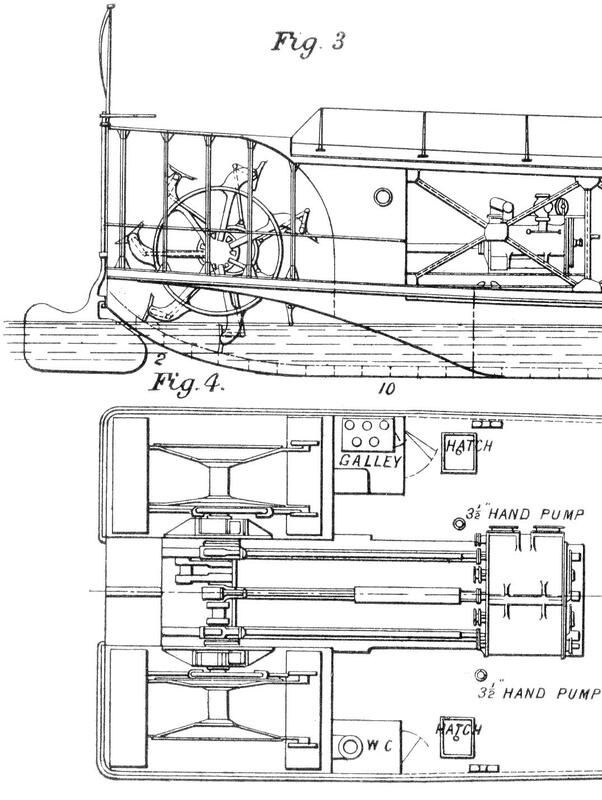 The continuing explosion of transportation technology in the twentieth century, including interstate highways, automobiles, trucks, and airplanes, eventually spelled the end of steam-powered boats. When the Corps of Engineers retired the Montgomery on 8 November 1982, she was one of only two snagboats remaining in the United States. On her final day of service, the Captain wrote of the Montgomery in his log: "Me and [the crew] are very sad this day!! This boat has been a workhorse of the tri-rivers." In 1984, the Mobile District of the U.S. Army Corps of Engineers awarded a contract for extensive restoration work on the Montgomery. This work included replacing old material with new, sandblasting the entire hull and coating it with five layers of paint, and draining and cleaning the diesel fuel bunkers. After her first restoration, the Montgomery was moored at the Tom Bevill Visitor Center, Pickensville, Alabama. Visitors could tour the boat, reliving her days on the South's rivers. The Montgomery has another claim to fame. In 1984, the Montgomery was used as a set in the television movie Louisiana, which starred Margot Kidder, Ian Charleson, Victor Lanoux, and Andréa Ferréol. In the movie, the Montgomery is repainted and modified to resemble an ante-bellum passenger sternwheeler. 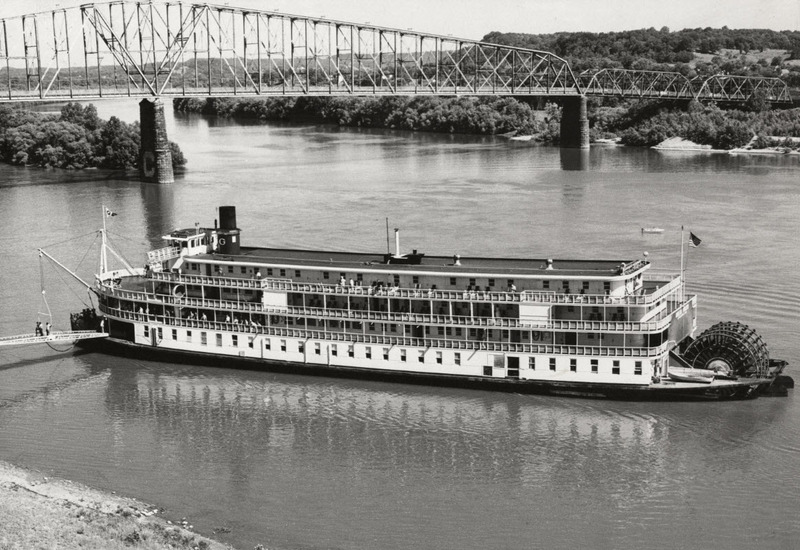 However, the Montgomery has an unfortunate end in the movie; during a riverboat race, the sternwheeler explodes. Beginning in the early 21st century, the Mobile District realized that exposure to river traffic and environmental factors were causing irreparable harm to this National Historic Landmark. They made the decision to remove her from the Tennessee - Tombigbee Waterway. On 2 October 2003, the U.S. Army Corps of Engineers, Mobile District, with the assistance of two derrick barges lifted the Montgomery on a specially-designed cradle and placed her in a dry mooring basin beside the lovely Tom Bevill Visitor Center. In late 2003, a maintenance plan was developed for restoration of the Montgomery. In early 2004, extensive restoration began. Contractors under the direction of USACE's Tennessee-Tombigbee Regional office, removed and replaced rotting decking, painted all exterior and interior surfaces, and replaced the pilot house windows and framing, along with numerous other tasks. The History Workshop, a division of Brockington and Associates, Inc., developed a new interpretive plan that includes this website, new interpretive panels on the boat and the surrounding walkway, educational materials, a touch screen kiosk, video presentations, and two brochures. All of this work culminated with a Grand Re-Opening and Restoration Celebration on 28 October 2004. After an early morning tour of the restored boat, Former Master Cleve Fleming cut the ribbon reopening the Montgomery to the public. That afternoon, sixth graders from Pickens County were among the first to tour this restored sternwheeler. 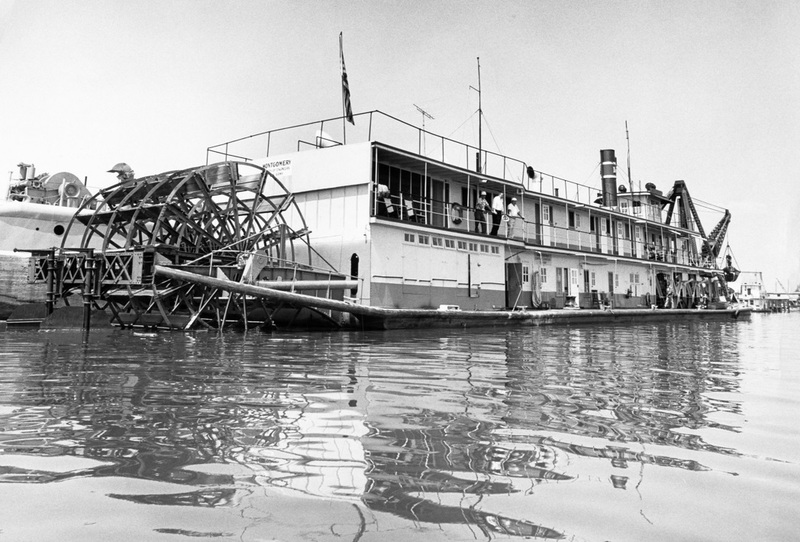 Today, the U.S. Snagboat Montgomery, a National Historic Landmark, is one of two remaining steam-powered sternwheel snagboats in the United States. Please come to Pickensville and see her for yourself. Her skipper, Captain David Tipton, died at the wheel of the MACKENZIE on Lake Pepin, near Reads Landing, Minnesota September 22, 1904 and the boat was renamed in his honor. The U.S. Engineers operated her on the upper Mississippi River until 1920. Captain Frank Martin was her last master. She was sold at public sale conducted at Rock Island, Illinois, to Meyer Katz, St. Louis, and John F. Klein, Pittsburgh. In late 1923 she was sold to two Memphis, Tennessee railroad men, named Peel and Bachelor; who renamed her URSIE BOYCE. She was converted to a packet and put in the Memphis-White River trade and later became the CITY OF CAIRO. 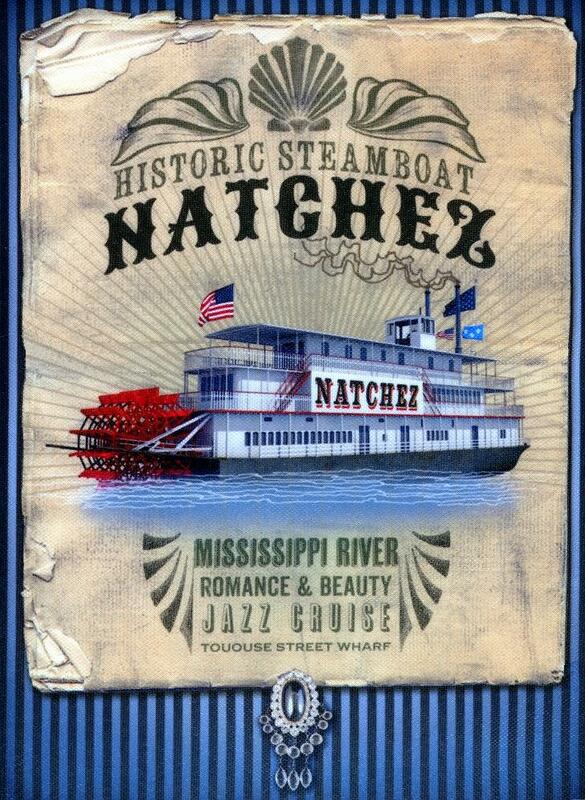 Beautiful color photo of the NATCHEZ on the Mississippi at New Orleans by John Darré. 12 x 24 inch canvas print mounted on substantial wooden stretcher bars, great for display. A worthwhile acquisition. The attached unusual real photo post card is of two working men standing in a small barge which is full of what could have been firewood to feed the furnace under the boilers on a steamboat. 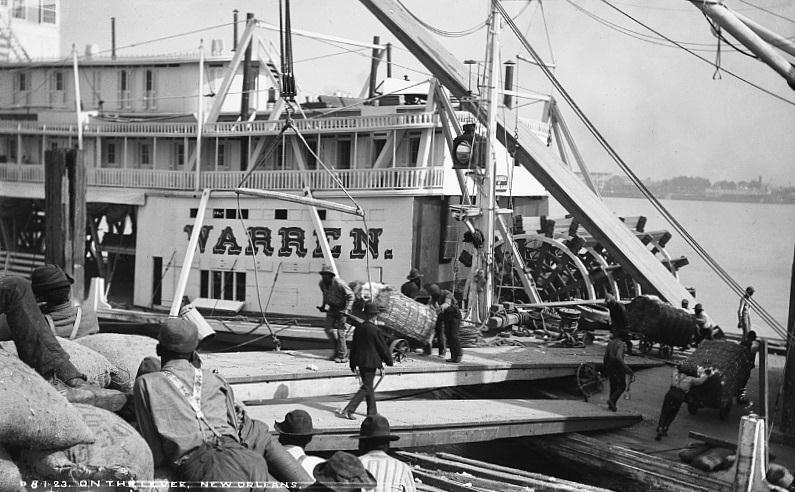 Behind the men on the mini-barge can be seen the main deck of what must have been a two story "Quarter Boat" where crew members had their meals and slept on beds or bunks. The body of water the barge and Quarter Boat are floating in is narrow so it was probably a canal and on the back of the card is written St. Louis, MO. Historians of the city might offer some theories as to where this canal was located.